Quattro Hotel and Conference Centre is conveniently located near many attractions. Suitably situated uptown Sault Ste. Marie, Ontario near many shopping centers, restaurants and much more. Local points of interest include the Canadian Bushplane Heritage Centre, the Agawa Canyon Tour Train, Searchmont Resort, Crimson Ridge, John Rowswell Hub Trail and Mill Market. Located on the banks of St. Mary’s River in Ontario, Canada, Sault Ste. Marie is connected to its sister city in Michigan by the Sault Ste. Marie International Bridge. Cambrian Mall is less than a mile away and features dozens of retailers and specialty stores. The hotel’s on-site restaurant, Quattro Vinotecca, is a great place to unwind with a delicious meal after a long day or room service is available if you prefer to relax in your spacious suite. Hotel features include: • Free hot breakfast • Free wireless high-speed Internet access • Free weekday newspaper • Free local calls • Free coffee Guests of this Sault Ste. Marie, ON hotel can enjoy additional features such as a fitness center, indoor heated salt water pool, hot tub and sauna. Located off the lobby is Greenhouse Spa, take time to relax and unwind with a wide variety of services; manicures, pedicures, facials and much more. 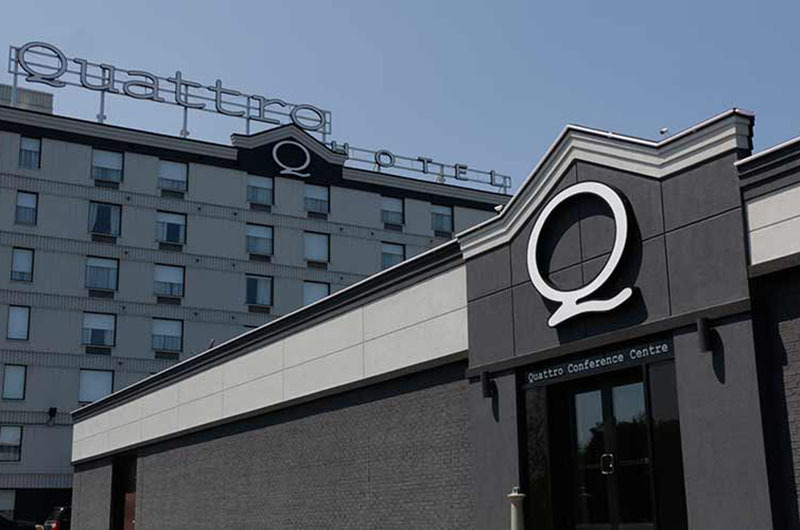 This Ontario hotel offers corporate travelers an array of modern conveniences including an on-site business center with internet access and access to copy and fax. With seven spacious banquet and meeting rooms, the Quattro Hotel and Conference Centre hotel is the perfect venue for your next special event. Teleconferencing service is available. All guest rooms at this Sault Ste. Marie, ON hotel are oversized suites and furnished with flat-screen televisions, coffee makers, desks, refrigerators, microwaves, sofa sleepers, irons and ironing boards. Keep your electronic devices charged with the recharge device including AC and USB outlets provided in all guest rooms. Laundry facilities are located on the premises and ample parking is provided. At the Quattro Hotel and Conference Centre, both business and leisure travelers can enjoy numerous features and outstanding service. When your travels bring you to Sault Ste. Marie, make us your home away from home and we’ll make your visit to Ontario one to remember!